In Chinese symbolism, a crab signifies prosperity and success. 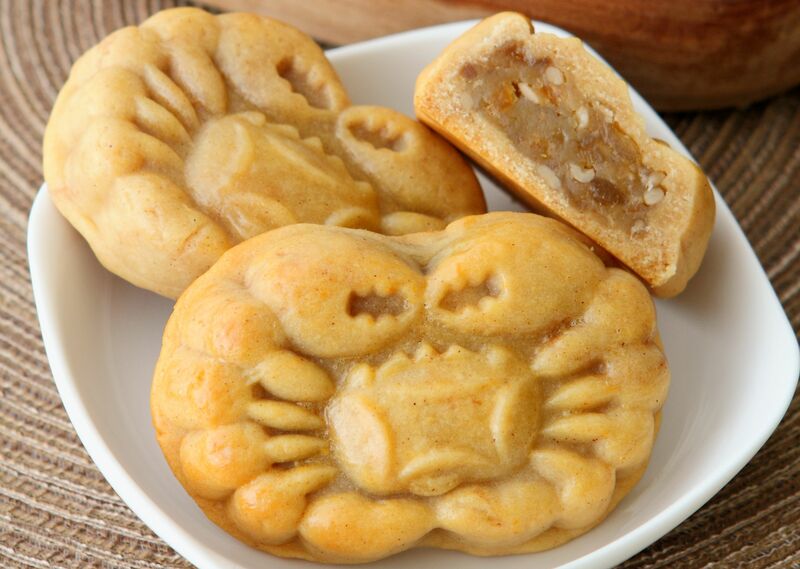 Give these Prosperity Mooncake Biscuit out as gifts as well wishes to your family and friends. In a bowl, combine golden syrup, palm oil and alkaline water with a spatula. Cover with cling film and rest for 1 hour. Sift flour into the mixture, add orange zest and mix into a dough. Cover with cling film and rest for 1 hour. Divide into 35g portions. Combine ingredients and divide into 25g portions. Dust your hands with flour, then lightly press each dough into a circle, place the filling in the centre and wrap the dough around the filling to enclose it. Press into mould and unmould onto a greased baking tray. Brush with egg wash and bake in pre-heated oven at 170ºC, for 15 minutes. Allow to cool before storing.